The popularity of different calibres has varied depending on the tactical needs of the time. However, the first true automatic cannon emerged in the nineteenth century in 37mm calibre for legal reasons. In the middle of that century explosive projectiles were introduced in small arms. These were felt to be inhumane when used against soldiers, so an international convention was held which led to the St Petersburg Declaration of 1868, limiting their use to artillery projectiles weighing just under one pound (400g). At the time, this equated to a calibre of 37mm, so this became an international standard which was honoured for the next half century. By the start of the First World War, except for a few obsolete weapons there was a huge calibre gap between RCMGs and 37mm cannon. The pressure of war eventually led to a demand for intermediate calibres, partly to deal with the new tanks and partly to provide more firepower for aircraft without burdening them with large cannon. Aircraft weapons in 20mm and 25mm were developed which, although initially available only with solid shot, used HE projectiles by the end of the war. Weapons of 12.7-13mm were also being developed when the war ended. 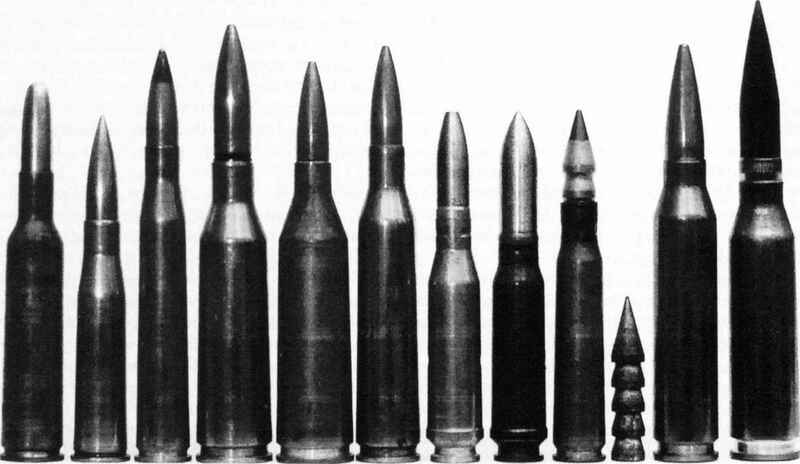 In the inter-war period, several automatic weapons in 12.7-15mm were introduced, but 20mm became established as the smallest calibre whose projectiles were capable of carrying a useful quantity of HE. It therefore became a standard calibre with the great majority of nations and has remained so up to the present time. The 37mm calibre remained popular and was joined by 40mm weapons from Britain and, most notably, Bofors in Sweden. This remained the largest calibre to see significant service in automatic weapons until the middle of the twentieth century (with the exception of the early Hotchkiss manually driven revolver cannon). Before the Second World War there were few weapons in calibres intermediate between 20mm and 37mm, the most significant being 25mm AA guns used by France, Japan, Sweden and the Soviet Union and the American 1.1" (28mm) naval gun. More emerged during the war, with 23mm weapons becoming established in the Soviet Union and 30mm guns, initially for aircraft, in Germany. Attempts were made in both Germany and Britain to produce fast-firing automatic weapons in 50-57mm calibre, but these were not particularly successful until after the war. After the lessons of the war had been absorbed, NATO broadly settled for automatic cannon in 20mm, 30mm and 40mm calibre (with 35mm, 27mm and 25mm being added later) plus a few naval guns in 57mm. NATO cartridges are allocated STANAG (Standardisation Agreement) numbers, which specify characteristics required to ensure inter-operability in different weapons. The Warsaw Pact (and by extension China) has used weapons in 23mm, 25mm, 30mm, 37mm, 45mm and 57mm calibres. It should be noted that NATO currently produces weapons using three different 20mm cartridges, two 25mm and at least four 30mm (six if variations using different case materials are counted) as well as 27mm, 35mm and 40mm. In contrast, the complete and considerable range of Russian automatic cannon currently in production uses either the 23 X 115 or the 30 X 165 cartridge (although the latter has percussion and electrically primed versions), with the 30mm dominating. In the HMG field, NATO adhered to the 12.7mm calibre and the Pact, while retaining and improving their 12.7mm guns, added a 14.5mm weapon. 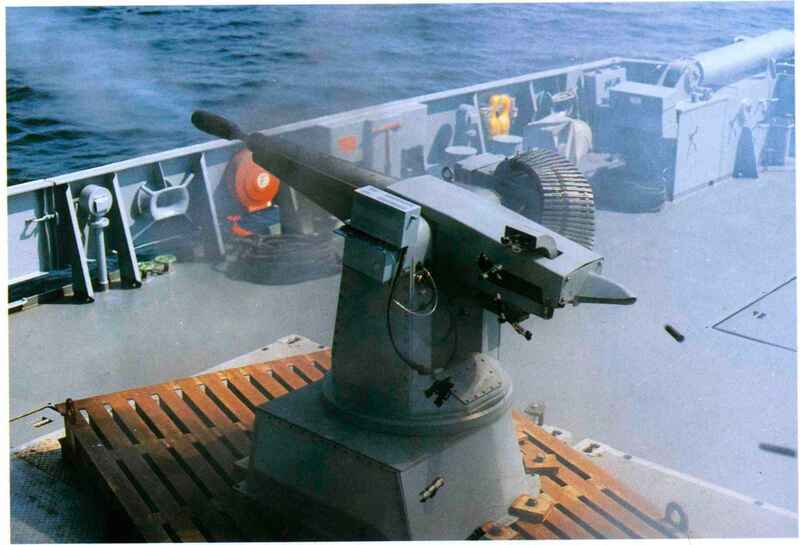 Naval requirements saw the introduction of automatic weapons in larger calibres from 76mm upwards and there was much experimentation with large-calibre army AA guns before the advent of guided missiles. For the most part these lie outside the scope of this book and will only be mentioned briefly. 13.2mm guns automatkanon, presumably because accepted since the Second World War. Before then, they were larger than usual for aircraft guns at the the term 'machine gun' was used to describe a rela- time, while their navy called the m/32 25mm a /actively small-calibre weapon normally firing solid spruta (which translates as machine gun), presumably because this was a small weapon by naval standards. Since the war the definition of a cannon as any practice with the selection for the RAF of the French Hispano moteur-canon in the late 1930s. Anglicised as 'cannon', the name became adopted for the Hispano and subsequently for all other automatic shell-firing guns of 20mm or more calibre. Germany, automatic weapons of up to and includ-20mm were known as machine ing zumm were Known as macnine guns (Maschinengewehr) with larger calibres being known dards, so the term HMG has come to be used for a class of weapon which fits in between RCMGs and cannon. By some form of convergent evolution, the as cannon (Maschinenkanone), leading to the MG calibre of virtually all HMGs to see service has fall-and MK prefixes. In addition, designations based on en within the range 12.7-15mm. function were used for particular applications, whether or not the weapons were automatic. A gun intended for the anti-aircraft role was called Fliegerabwehrkanone (sometimes given as Flugzeugabwehrkanone or Flugabwehrkanone), for the anti-tank role Panzerabwehrkanone and for mounting in armoured fighting vehicles Kampfwagen k a none; FlaK, PaK and KwK for short. The BK (Bordkanone) designation was used in the GUN DESCRIPTIONS Second World War for very large calibre (37 + mm) A gun is in principle a simple device. Its airborne cannon intended for ground attack. It has also been only in the last half-century that metric calibre measurements have almost entirely taken over from inch measurements in Britain and the USA. Even within the metric group, practices have varied. In wartime Germany, heavy weapon calibres of 2cm or more were usually described in centimetres rather than millimetres. the cartridge, and strong enough to resist the firing pressures (which may exceed 400 MPa); a barrel to guide the projectile and contain the propellant gases for long enough to permit the projectile to accelerate to its maximum velocity; a method of firing the cartridge at the required instant; and some means for removing the fired case and inserting a new cartridge. The last requirement results in the need for a break, or breech, in the rear of the chamber, to enable cartridges to be inserted or withdrawn. The back of the chamber is known as the breech face. The part of the gun which is pressed against the open rear of the chamber during firing, and is moved out of the way to permit reloading, is known as the bolt or breechblock; generally the term 'bolt' is used if it moves to and fro along the same axis as the barrel, and "breechblock" if it is moved vertically, sideways or tilted away from the breech. This usually contains the mechanism to fire the cartridge. In all except revolver mechanisms, the chamber is contained in the rear section of the barrel. Sometimes the barrel is extended rearwards in order to provide the locking surfaces for the mechanism; this part is unsurprisingly known as the barrel extension. The body of the gun, into which the barrel, bolt and other mechanisms are fitted, is known as the receiver. Other components are some means of holding an ammunition supply ready for loading, an appropriate method of mounting the gun (which may be fixed or mobile, and in larger calibres may require some mechanism to absorb recoil) and a sighting device to give some expectation that the projectiles will hit their target. All cannon and HMG barrels are rifled, except for those specifically designed to function with fin-stabilised projectiles. The rifling consists of spiral grooves in the barrel which grip the projectiles (by their driving band in the case of cannon projectiles) and spin them to ensure they are stable in flight. The degree of twist needed depends on the length of the projectile the gun is designed for; the longer and heavier the projectile, the steeper the twist. There is a risk that the impact of hitting the rifling might strip the driving band, so some cannon are designed with progressive rifling - that is, the grooves start out being parallel with the barrel to offer the minimum resistance, then gradually begin to twist until they achieve the desired rate. Some artillery weapons have had the final section of the barrel smooth-bored at the projectile diameter so that the driving band (which is cut up by the rifling) is squeezed smoothly against the projectile to reduce aerodynamic drag. The USNTs peculiar Mk 11 20mm aircraft gun, which had rifling in only the first few centimetres of the barrel, is a very rare example of this being applied to automatic weapons. It was not regarded as successful. What gun uses 12.7x 110?